It’s been some time since our last post, since we have been very busy bussing our way through Peru the last 2 weeks! Peru is a country of extremes. We went from the very, very dry coast (Lima hardly gets any rain, maybe 10mm a year) with dry mountains and sand dunes, to the humid climate in the Sacred valley. The landscape did remind us a bit of the Middle East, especially along the coast with almost no vegetation. It is very obvious that Peru is a poor country. And there is trash everywhere. On top of this, all houses seem to be unfinished; with bare red brick walls with rebar sticking out everywhere, no windows and just a little tin roof. But this has a reason. Apparently the Peruvians pay lower property tax until the building is finished. And thus they don’t finish it. The landscape of Peru is beautiful, but all the trash and unfinished houses make this sometimes harder to see. And Peru has a lot of dogs! Maybe this is something that is typical for South America, I’m not sure yet, but there are stray dogs everywhere. The ones we did encounter where very friendly though, so nothing to be scared about. All in all we had a great experience, with friendly people, good food, and beautiful sights, all based on the rich cultural history of this part of South America. First we spent one day in Lima. We stayed in the Miraflores area, an upscale part of the city that is also very safe. We explored Huaca Pucclana, a temple in the middle of the city built by the Lima’s (200-700 AD). We ate a very nice ceviche for lunch at Punta Sal (gracias Martin Vagn Hansen :)) and walked around in Miraflores. Manon was eager to try Restaurant Central, one of the very good restaurants Lima has, but unfortunately we happened to be there on a Sunday and then many things are closed, including restaurants. The following day we had to get up early, because we would be picked up by the PeruHop bus to get to our next destination. PeruHop is a hop-on-hop-off bus company that was set up by two Irish guys 3 years ago. It’s an easy and safe way to get around in Peru, and makes you able to get to a lot of different places in a short time. We were short on time in Peru, we only had 2 weeks, so perfect for us! The good thing about PeruHop is that they pick you up from your hotel, drop you off at your hotel and they make some short stops on the way for excursions or viewpoints. The first destination after Lima was Paracas. On the way we had a stop to taste the ‘best bread along the Pan American highway’ and a short excursion at Casa Hacienda San Jose to learn about the slavery in the time of the Spanish. Paracas is a small tourist town located close to the Ballestas Islands. This is the main reason for all people to make a stop here. The Ballestas Islands are also called ‘Poor man’s Galapagos’, so lets see if that makes sense! In a large speedboat with 40 other people it takes 30min before you are sailing around the islands. Wow, so many birds!! There where thousands and thousands of Boobies, thousands of Cormorants, some pinguins, pelicans and many sea-lions. You can’t compare it with the beauty and diversity of the Galapagos, but there are definitely a lot of animals to see :). After Paracas we went to Huacachina, an ‘oasis’ in the middle of the desert. Before we arrived in Huacachina we made some stops to have a view over the beautiful Paracas National Reserve, a place where the blue ocean comes together with the red and yellow sands of the desert. Huacachina is again a town that only exists for tourism, and that makes it a bit of an ugly oasis. However, the main reason to come to this place is to have fun in the sand dunes. And that is what we did! We went on a sand buggy tour to race over the sand dunes, and did some sandboarding as well. We were a bit nervous for the sand buggy ride, since they do have a bit of different safety standards in Peru… but all went fine :). The sandboarding was really fun. Some of the dunes were pretty high and steep and made you go down pretty fast! Then we drove further to the famous Nazca lines. To have a good view on those large drawings in the earth you need to get into an airplane. We didn’t do this, but we did see two of the drawings from a viewing platform. After dinner at the Petro station we continued the whole night to arrive in Arequipa the following very early morning. Luckily we could check into our hotel room immediately to catch some sleep. The day after we went on a tour to the Colca Canyon. With a depth of 3270m this is one of the deepest canyons in the world. We had a very early start (a little van picked us up at 3:00 am) and a long day. After a long drive into the mountains we made a quick stop at the highest point of that day at 4900m. From here you had a very nice view over all high peaks surrounding you. Sabancaya, the most active volcano of Peru, even treated us with a little explosion creating a steam cloud. We had breakfast in the town called Chivay, and then continued to the Colca Canyon, while doing some stops along the way. Unfortunately most of these stops were a bit of tourist traps; just a lot of people trying to sell you something. The main viewpoint over the canyon, Cruz del Condor, was the furthest stop on this tour, where we waited for an hour to see the famous Condor, but they unfortunately didn’t show. And then we had the long way back to Arequipa. A bit too much in one day but that’s what you get if you want to do many things in a relative short time. Ralph is quite a sight with his length! The second island we visited was Taquile Island. At this island in the Titicaca lake about 2000 people live. The people on the island are known for their hand-woven textiles and clothing. The funny thing is that exclusively the males do the knitting. The females are spinning the wool. Coca leaves are very important for them (chewing them or putting them in your tea should help for altitude sickness) and they always carry a bag with leaves with them, which they exchange with each other as a greeting. The following morning we decided to try to get onto the first bus, so another early morning… at 05:00 we where waiting at the bus stop with many other people. But we managed to get to the entrance of Machu Picchu just before 6AM, when it opens, so that was perfect. We immediately walked up to get the first view over Machu Picchu. And wow! That is pretty amazing! It is something we have seen on pictures a lot of times, but it is really special to be standing there and seeing it with you own eyes. The nice thing about being so early is that you manage to have the classic view over Machu Picchu without many people walking there yet. Then we strolled around over the complex because we had to wait for our time slot to climb Huayna Picchu, the mountain you see in the background of all classic pictures. They only allow 400 people per day on this climb, so it is something you need to book up front together with your entrance ticket. It was a spectacular hike. A very steep path leads all the way up to some other Inka remnants on top of the mountain from where you have a beautiful view on the Machu Picchu: well worth the effort! We were very lucky with the weather that day. A bit of sun in the morning, and it only started raining the moment that we left. We talked to people who went the day after and they couldn’t see anything because of low clouds and rain. Lucky us! We took the train back to Ollantayambo the same day, and got back to the hotel in Cusco that evening. It was raining for the full day the next day, so this gave us time to arrange tings for our next destination. We found out that the boat with our car got some delays, meaning it would arrive 4 days later in Montevideo. This made us decide to go to Buenos Aires for a week to take some Spanish lessons. So we arranged bus+ferry tickets to get to Argentina from Montevideo and found a nice AirBnB to stay for the week. The day that we planned to fly to Montevideo went a bit different than we thought. First our very early flight from Cusco to Lima (05:35 am, we are getting very trained in getting up early!) was canceled. That meant we missed our connection in Lima to Montevideo. The only option they could give is was to fly to Montevideo via Sao Paolo, even though we asked if they could book us on a flight to Buenos Aires directly. Then our plane to Sao Paolo was not able to land on that airport, so after flying circles for some time we had to land in Rio de Janeiro. We were not really getting close to our final destination… After refueling, the plane continued to Sao Paolo where we arrived midnight. Here we finally managed to be booked on a flight directly to Buenos Aires, but the next day. The airline gave us a voucher for the airport hotel, so we managed to have a couple of hours sleep before finally arriving in Buenos Aires. Here we will stay for a week, do some sightseeing, planning ahead before the car arrives and improve our Spanish! Klinkt allemaal erg leuk! En wat een prachtige plaatjes schieten jullie. 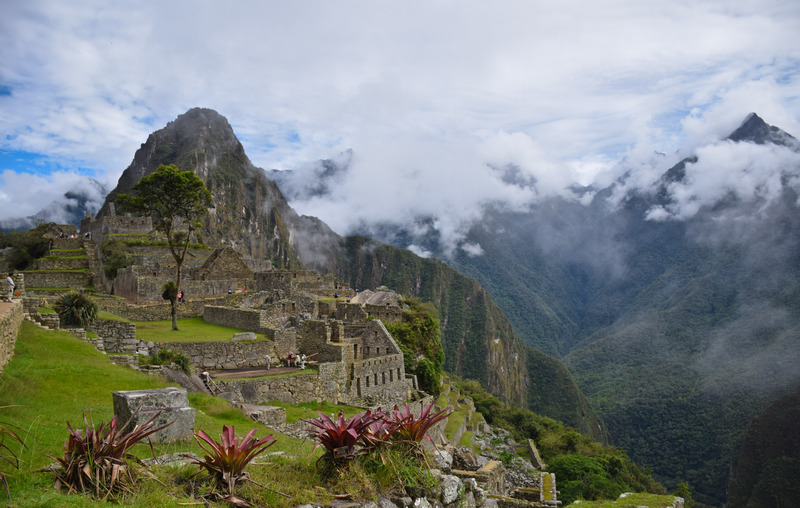 Machu Picchu is erg mooi zo met wat rest wolken. En geluk dus met het weer, echt fijn dat jullie gewoon uitzicht hadden daar. Bijzonder dat de kust zo droog is, dat wist ik helemaal niet eigenlijk. Het lijkt inderdaad op het midden-oosten zo te oordelen van de foto’s.